Western Michigan may have outplayed host Ohio State for most of its weekend series, but it was the Buckeyes who came away with a two-game sweep. OSU won both contests, 4-2. In the first game, Jared Katz gave Western Michigan a first-period lead. The Broncos remained up one through the beginning of the third period, but Ohio State rattled off three goals in a 49-second span. Luke Witkowski’s power-play goal brought WMU back within one, but a late OSU goal ended any comeback hopes. Riley Gill made 34 stops for the Broncos. Dustin Carlson stopped 19 for the Buckeyes. In the second game, after Ohio State took a 2-0 lead, Greg Squires scored a power-play goal late in the first period to pull the Broncos to within a goal. Then, with OSU up 3-1, Patrick Nagorsen made it 3-2. For the second straight night, a late Ohio State goal — this time an empty-net goal from Peter Boyd — ended it. 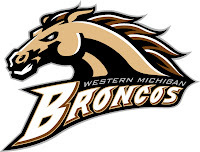 Gill had 26 saves for WMU, while Cal Heeter made 36 for OSU. The Broncos (5-4-1, 1-4-1-1 CCHA) are set to host No. 1 Miami next weekend. Both games begin at 7:35 p.m.